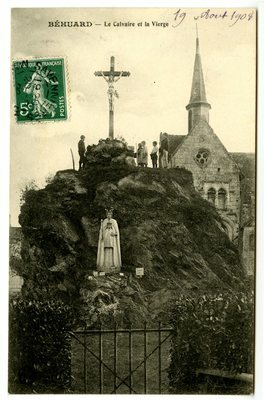 "Le Calvaire et la Vierge postcard"
Picture postcard depicting visitors at a statue of Jesus crucified with a statue of Madonna and Child in Pays de la Loire, France. U.S. and international copyright laws protect this digital resource. Commercial use or distribution of the resource is not permitted without prior permission of the copyright holder. Please contact the Marian Library-International Marian Research Institute to inquire concerning available permission to use the digital image.